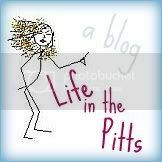 Life in the Pitts: And you thought I was the irreverent one in the family. And you thought I was the irreverent one in the family. Kurt: "I will go and do the things that the Lord has commanded, blah blah blah..."
Kurt: "Yes. It's in there. If you read your scriptures more often, you'd know that." id love to see him teach sunday school! I've tagged you in my blog today so stop by sometime if you get a chance! Ha! ... I've searched the index but I'm having a hard time finding that scripture. Maybe I need to read between the lines?